Our board meeting concluded last week, and I am so relieved (BIG sigh). I was so exhausted on Friday that when I got home, I slumped on my couch and dozed off. It was 8 PM when I awoke to the knocks of "trick or treaters." Mom told me there were a lot of knocks earlier, and that I should take over answering the door. What a mess! I even forgot to get ready for Halloween. Anyway, I still managed to greet and give the ghosts, goblins and witches some sweets. It was a delight to see the kids in costumes. Too bad I didn't get to scare any of them this year. Well, as they say, there's always next year. Mom and I took to cooking on the morning of Saturday. Mom made a simple sweet rice dish while I cooked my oil splattering lechon kawali. After Halloween, people start preparing for Thanksgiving and Christmas, so it was a delight to visit the mall on Saturday and see Christmas decorations already up and glimmering. Stores are either having their after Halloween sale or pre-Christmas discounts. At this time of year, the kid in me lights up to the sight of tin canned chocolates and cookies, decorations of brightly wrapped presents, the presence of Santa Claus taking photos with the kids, and most of all, the sound of Christmas songs playing in the air. To me, Christmas is the best time of the year. After prowling at the mall, Mom and I went to our favorite store called "World Market," and boy oh boy, they've got all sorts of sweets and Christmas treats from all over the world. 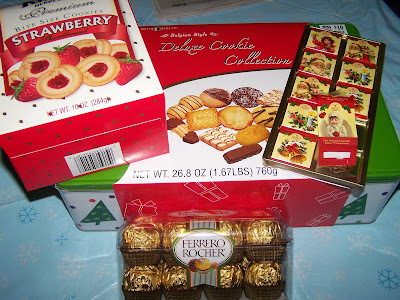 I went a bit crazy (what the heck, I went CRAZY) with the tin canned gingerbread cookies and chocolates. I bought a few of my favorites (photo) , and I'm sending some of those to some friends. It was as if, Christmas came early to my house. Believe me, the shopping was great, but Mom and I also managed to make it a movie weekend. We watched "Indiana Jones and the Kingdom of the Crystal Skull" and "Journey to the Center of the Earth." Both movies have the very entertaining factor, which is what I needed when all I've been doing the past few days was sit through hours and hours of meetings. I've always been an Indiana Jones movie fan, but I didn't like the incorporation of superior alien beings with skulls/bones made of pure crystal. Anyhow, I'm just glad to see Harrison Ford back as Indiana Jones. As for "Journey to the Center of the Earth," I thought it was a fascinating idea that there'd be an existing world in a world beneath us. I guess that's the work of fiction, to take your mind off from the present undertakings of your current world and transport you to a world of imagination. I clearly needed to be transported to a different time and space, as my current world is so busy, so stressful, and so full of decisions. I need to get away - even for just a few hours. Well, this is a quick update of what I've been up to. I have another meeting this afternoon and a planning meeting next week. Perhaps after all these, it will be smooth sailing towards the coming holidays. I am in dire need of a vacation because at the moment my mind is numb and spinning. "To me, Christmas is the best time of the year." Same here! It's really my favorite time of the year (yes, even over my birthday!). Have a great week kayni! At least you had a relaxing weekend complete with chocolates to compensate for an exhausting Friday! I am feeling the Christmas already. Will probably buy some decors this weekend. Hope you'll get your needed vacation soon! sheng, if i can just push a box of cookies through my monitor, wouldn't that be sweet =)? kg, have a great week too. i agree. christmas is better than birthdays. you don't get old on christmas...lol. wits, it's the end of the year, so we're trying to tie loose ends before 2009 hits. it's crazy. josiet, i've been debating about decorating my apartment. i'm still not sure. would love to see your decorations. angeli, well said. christmas never fails to do that. it must be the presents. layrayski, you know, i might just go for a vacation soon. i still don't know where...lol. well i thought i recognized those chocolates from germany and i was right ;) can't resist clicking on the picture..